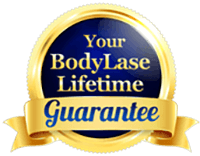 At BodyLase®, we are committed to maintaining your security and confidentiality in the use of any private information you choose to share with us. We do not disclose identifiable information to any third party without your consent. Further, we do not sell, rent, or otherwise allow the unauthorized outside use of personal information such as names, addresses, phone numbers, or e-mail addresses in our database without your permission. Credit Card numbers are used only for processing payments and are not used for other purposes. We collect only the domain name, but not the e-mail address of visitors to our Web page, the e-mail addresses of those who communicate with us via e-mail, aggregate information on what pages consumers access or visit, information volunteered by the consumer, such as survey information and/or site registrations, name and address, telephone number, fax number, payment information (e.g., credit card number and billing address). Visitors may browse our web site without revealing any personally identifiable information. What Personal Information About Customers Does BodyLase® Gather? Information You Give Us: We receive and store any information you enter on our Web site or give us in any other way. You can choose not to provide certain information, but, then, you might not be able to take advantage of many of our features. We use the information that you provide for such purposes as responding to your requests and communicating with you. E-mail Communications: To help us make e-mails more useful and interesting, we often receive a confirmation when you open e-mail from GetBodyLase.com if your computer supports such capabilities. BodyLase® understands that personal privacy is of utmost importance and all information you provide is confidential. We may collect your Internet Protocol (IP) Address to monitor the quality of website traffic. IP addresses are not linked to personally identifiable information. No personally identifiable information will be collected unless you specifically provide it to us, in which case we hold that information in strict confidence. BodyLase® does not sell products for purchase by children. If you are under 18, you may use GetBodyLase.com only with the involvement of a parent or guardian. Our customers are given the option of registering with us to receive special offers, newsletters and new product updates by E-mail. If at any time you decide that you no longer wish to receive these communications, you may opt out of receiving them by simply clicking on the “unsubscribe” link, which is attached to every E-mail that is distributed to our customers. By clicking on this link, you will automatically be deleted from our mailing list and will not receive any further E-mails. Should you wish to be added again in the future, just do a basic registration the next time you visit www.GetBodyLase.com. To do this, simply click on the “Register Now” button on the home page and fill in your name and E-mail address. This will add you, once again, to the mailing list.